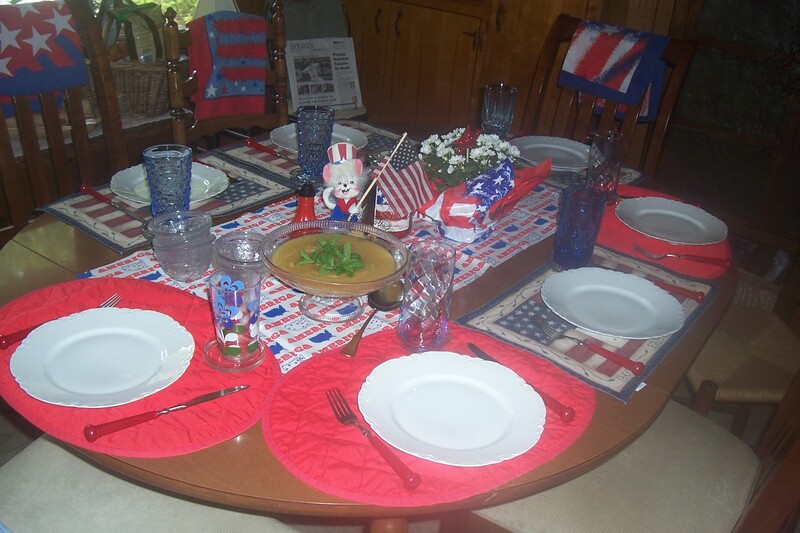 And to prove that it’s still summer, here’s a photo of the table my mom set for our Fourth of July family get-together. She’s the queen of holidays and has an incredible storehouse of linens, plates, glasses and serving pieces in almost any color you need. Sadly, she did not pass this creative design-ability on to me, although I do honor Christmas by bringing out coffee mugs with snowpeople on them. So there. What I really like about this photo, however, are all the little clues it has about my family. For instance, the spearmint sprigs on the applesauce came from Older Daughter’s garden that she optimistically replanted after the April 27 tornadoes carried her carefully nurtured seedlings away. My mom loves mint-flavored applesauce because her mom made it when my mom was little. Then there’s the potted centerpiece that my brother brought — the blossoms can be added to the flower bed and the plastic container recycled. And, finally, notice the newspaper in the back corner? I grew up thinking that it’s the most natural thing in the world to eat breakfast and read the newspaper and know what’s going on in the world before you headed out in it. And I still do. This entry was posted in family, fashion, food, holidays, home, journalism, random thoughts, Tennessee and tagged entertaining, fashion, Fourth of July, holiday, holiday decor, Independence Day (United States), patriotism, tablescapes by Coffee with Cathy. Bookmark the permalink. I think it’s more like luring one into a false sense of sercurity. The security of course knowing that fall is just around the corner. But you’re talking to someone that has reached that age where they wear Hawaian shirts year round (yes even in winter). Of course with a high of 102 yesterday and maybe a high of 101 today, they can lull me all they want. Bring it on…Fall that is. I refuse to let summer go, though I wish we could have spring which we never experienced this year. I’ve got to have knee surgery when it turns colder (I told Dr. Mann I was too busy right now), so it can stay warm for a while. Joe – I can just picture you in a Hawaiian shirt! And, Mary, so sorry about your knee. And you are so right that somehow we missed out on spring this year. I think the April storms blew us directly from winter into summer.